Yoan Gouffran's revealed Rafa Benitez's message to his Newcastle United players. Benitez was furious at the actions of Nottingham Forest midfielder Henri Lansbury during his team's 2-1 defeat last Friday night. 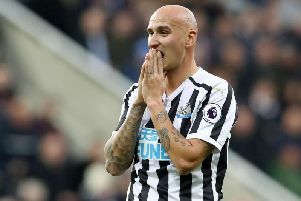 Martin sent off Jonjo Shelvey and Paul Dummett for incidents involving Lansbury during an incident-packed first half at the City Ground. Forest came from behind to beat United, whose lead at the top of the Championship has been cut to a point ahead of Saturday's home game against Birmingham City. The red cards shown to Shelvey and Dummett have since been overturned on appeal. Benitez was keen to get back on to the practice pitch this week. And forward Gouffran has revealed what United's manager said to his players on the training ground in the wake of the Forest game. "He just says to us that we have to carry on, to work hard, stay together, stay focused to the next game – change the bad mood," said Gouffran. The Forest defeat followed an agonising penalty loss to Hull City in an EFL Cup quarter-final at the KCOM Stadium. “I thought against Hull we played well, but we have to win," Gouffran told NUFCTV. "The goalkeeper was good, and so we were unlucky. “Against Nottingham, we started the game well, but we lost two players in the first half – nine against 11 was hard. "We tried to give our best, but it is impossible to win. Gouffran hadn't been on a losing side before this season before the Hull cup tie. “I felt bad because it was my first defeat," said Gouffran. "Sometimes in football you are lucky to win every game, but this was a loss." Gouffran, in the final year of his United contract, has refused to speak to written journalists this season.